The last couple of weeks have presented me with a real diversity of subjects to shoot! Last week’s post included some macro shots of flower blossoms and here is another with a different look. This magnolia blossom is darker, shows the texture and some color in the pedals and has a very different mood than the high key image from last week. Another subject I’ve been shooting lately is trains and an old train roundhouse where restoration is going on. I blogged about that a few weeks ago. This shot, of wheels and sprockets is a study in cold hard steel! A very different mood is set by this type of subject! It’s been an interesting couple of weeks. 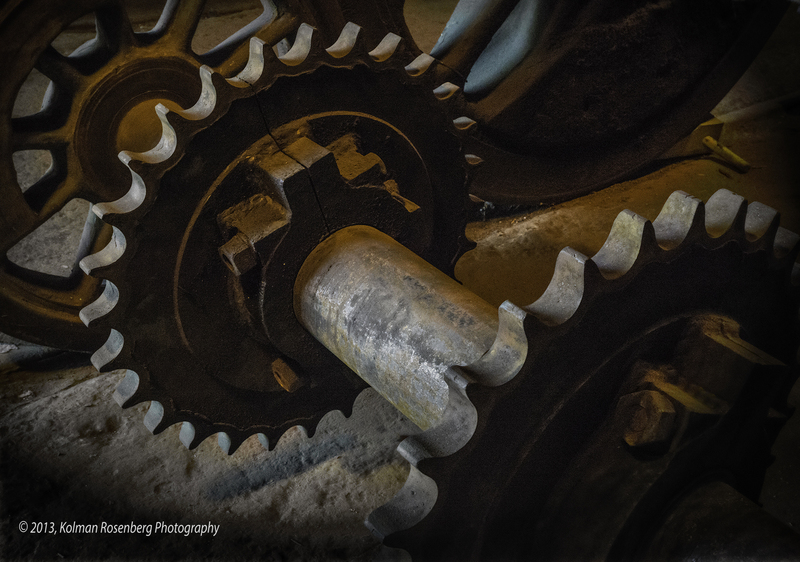 Yesterday I had the opportunity to shoot some very old engines, farm machines, farm implements and supplies from years gone by! Stay tuned for some of those images to come! This entry was posted in Uncategorized and tagged blossom, cold, color, flower, hard, iron, magnolia, railroad, restoration, roundhouse, soft, sprocket, steel, Texture, Train, warm, wheel. Bookmark the permalink. 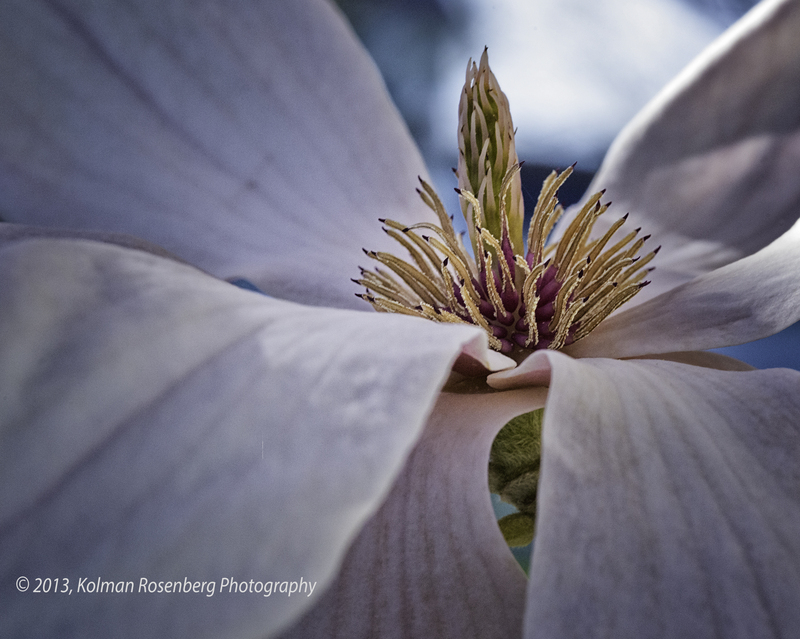 Fantastic images Kolman! Can’t wait to see the farm stuff! Thanks Barb! The farm/antique engine photos will be coming soon! Stay Tuned! A perfect pairing – two kinds of spiky things. I didn’t think of that! Thanks for that interesting comment Jerie! Now I’ll look at those two images differently. It is always interesting to see what you have been up to and how you visualize your photographs. I am looking forward to what you are going to be doing in the future. How long have you been a photographer? When did you feel that you had found your style? I like this magnolia better than the one you posted prior to this. It seems more realistic. The photograph of the wheels and sprockets is very nice. I feel as is they are in motion and I love the details and color. Hi Patricia, Thanks for the comment and I’m glad to hear you look forward to my posts and photos! I’ve been a photographer since 1968 when I started shooting for the college newspaper and yearbook. As a result, my style has been primarily photojournalistic, photos that are shot as is and rarely or minimally manipulated or adjusted in the computer. Lately though, I have been trying to shoot more artisticly, shooting close-ups, abastracts, etc. of the things that I see. Some of it is a stretch for me to try to see things differently. I’m also trying to see where I might use multiple photos and build composites in the computer to produce something very different from the original photo(s)!